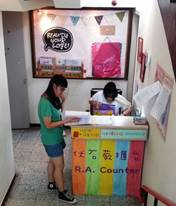 Housing in the Soochow University is more than just find a place to sleep, study, or store your things. It is to join a community that full of opportunities to make new friends, learn new things, and best of all, expand your horizons. The Student Housing Center plays as the key role on managing pleasant housing experiences for residents. We provide 7 dormitories, 3 on campus and 3 off campus, and 1 special cottage for international exchange students. Furnitured, well managed, and comfortable one-bed rooms to eight-bed rooms are available. Hall directors and resident assistants are there to help, but the residents manage themselves. The dormitory fee arranges from 8,500NT~34,300NT every semester. Except for on campus housing affairs, the Student Housing Center also offers information on nearby private student renting information and helping them handle with rental contract problems. So, why not set a time to visit us and find your new stay.